It hasn’t been the smoothest ride for AT&T Inc. (NYSE:T). In fact, after failing to push through $40 several times in 2016 and 2017, it’s been all downhill for T stock. Shares have already lost a whopping 15% so far on the year. Investors in the name have to be getting fed up with this terrible performance. However, some are surely asking themselves if now may be the time to buy, not sell T stock — especially now that it’s dividend yield is a whopping 6.1%. The payout for T stock has gotten extreme. I don’t mean extreme in the sense that — like General Electric Company (NYSE:GE) or Kinder Morgan Inc (NYSE:KMI) — AT&T will have to slash their payout. But rather, extreme in that the yield hasn’t been this high in years. In fact, AT&T’s dividend yield hasn’t been this high since 2010. However, the data actually gets more interesting: T stock has only had a yield over 6.9% twice, hitting that market in 1988 and briefly topping 7% in 2008. It’s always possible that AT&T again yields 7%. But given that it’s only been at or near that level twice in the last thirty years, I wouldn’t count on T stock yielding significantly more than that. In other words, further downside in AT&T stock is likely limited. For AT&T Inc. to start yielding close to 7%, we’d need a decline down to $29. Not that anyone would be super pumped to sit through a $3 per share (~10%) decline. But it wouldn’t be the end of the world, either. Also, don’t expect the dividend to be cut. T stock has not only paid out, but raised its dividend for 34 consecutive yields — no small feat through the 80s or the Great Recession. Now that we’ve looked at the yield, what about the company? Well, most of T’s issues have come from its attempt to acquire Time Warner Inc (NYSE:TWX) in a massive $86 billion deal. Even with steady cash flows and a hefty payout, investors are leery of a company taking on so much debt. That’s especially true after AT&T acquired DirecTV for almost $50 billion just a few years ago. While Time Warner owns a suite of content — including HBO — the DirecTV move hasn’t gone quite as planned. Subscribers have been declining as the cord-cutting trend really began to accelerate over the past few years. All you have to do is look at Netflix,Inc. (NASDAQ:NFLX) to know that. In any regard, it hasn’t made the DirecTV deal as accretive to AT&T as many investors once thought it would. With the subpar acquisition of DirecTV and the looming mega-deal for Time Warner, investors need to look for other catalysts. Unfortunately, that won’t come from growth. Analysts expect a 3.3% decline in sales this year, followed by a meager rebound of 0.4% growth in 2019. Fortunately, earnings are forecast to grow 11% this year, but many investors can attribute that to the recent tax cuts. In 2019, earnings growth slows to just 1.5%. Note: A decision on the T-TWX deal is expected by June 12th. So what do we do with T stock? It’s definitely not a pretty situation. Shares have essentially been trending lower over the two years. $31 ended up being a “double-whammy” level of support, with both its trend-line (in purple) and past levels playing a role. Apologies for the somewhat complex chart above. The key now is whether $31 hold. 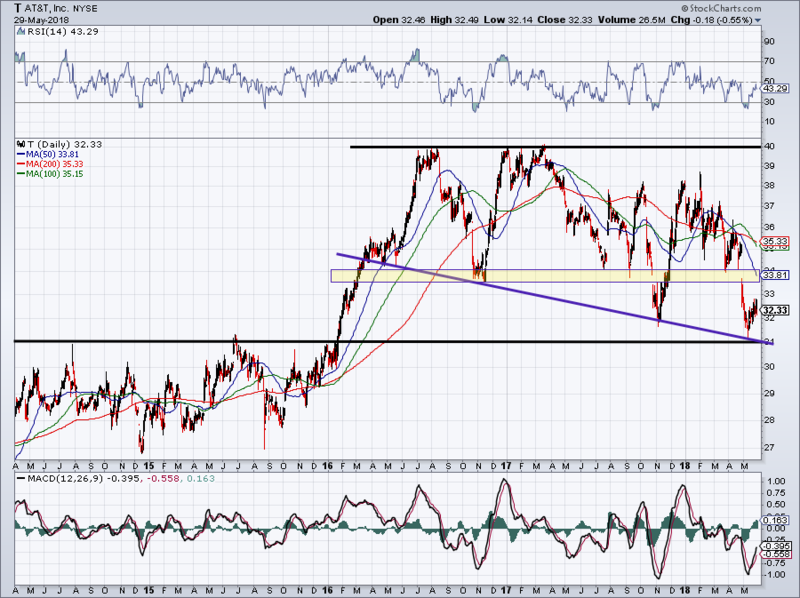 Should it do so, a retest of the $34 level should eventually be in the cards. Pushing through the $34 level would be incredibly constructive, although I don’t expect it to happen anytime soon. So what’s the play? Investors can buy T now to chomp on the juicy yield. A break below $31 could be their stop-loss if they don’t want to ride T stock lower. Conversely, investors can also buy Verizon Communications Inc. (NYSE:VZ), which yields 4.9%, has a lower debt load and doesn’t have a giant deal looming over it. The post Buy or Sell AT&T Inc. Stock With Its 6% Dividend Yield? appeared first on InvestorPlace.